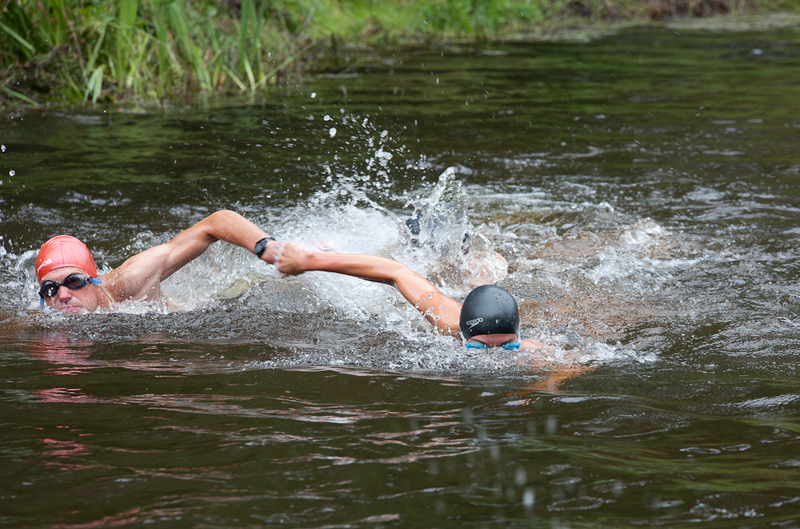 Despite the hot summer the water temperature in Lake Taylor, at the head of Danby Dale, was only 11degrees C on the day of the race. 11degrees C is close to the average for the history of this event, due in part to the constant flow of spring water through it, and this time no one bothered with a wet suit. A bit of rain the previous day made the going a bit soft on some parts of the run and a new fence at one field boundary created another obstacle. The wind was a light north-westerly favouring fast times for the bike section. 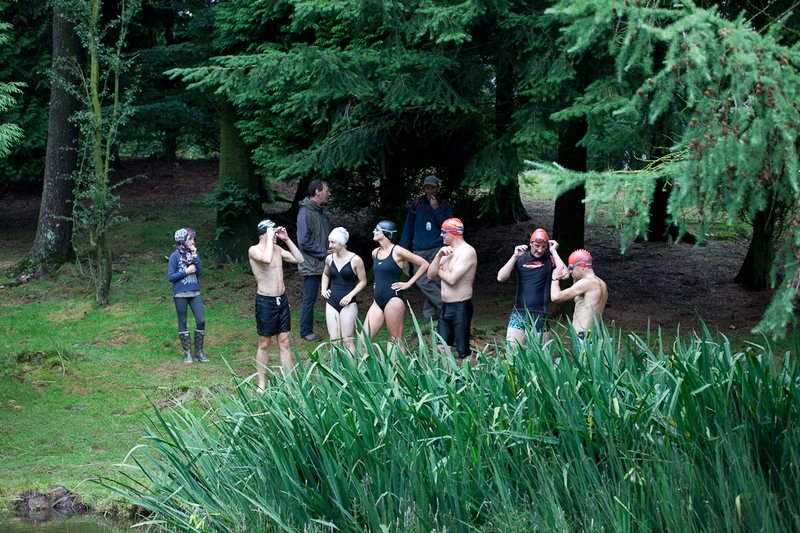 Six swimmers jostled for position after a tentative start from the bank. Lydia Gill-Waring made good her practice sessions in the pond and made it to the first buoy in front of the pack. Alina Kuntze, of Germany, was on holiday for a return visit to Botton and only volunteered to swim for the Rogers House Team a few days before but managed the 8 laps no problem. Ian Hopley led for most of the swim doing a personal best but was pipped to the post by Alan Ayres, who’d started from the back after losing his goggles. Hopley was attempting to stand up on the slippy clay in the pond as Ayres nipped past. Gill-Waring wasn’t at her best but did enough to set her team up for a record breaking time. Hamish Reid took up the baton and scorched round the steep cross-country course in the fastest time ever for this event. Hamish’s older brother Fionn did likewise on the bike, despite some slow traffic in Fryup, and together they produced the first decent team time in the event’s history. It was a day for breaking most of the course records with Josh Hopley setting a course record for the under 21s. This was his first attempt at doing the full course and the cold water took its’ toll as he struggled with balance and coordination in the transition from the swim. Ian Hatcher was due for a major knee operation but still did a brave race in the swim and then the bike course, although he benefitted from not knowing about the rule that drafting, in the bike section, was not permitted. The death of Michael Rogers, a year ago, has left a big gap to be filled as no super veteran has stepped up to the challenge of the times which he laid down in 2015. Alan Ayres managed to beat his previous best, set 11years ago, and led the individual participants home but the biggest cheer was saved for the spectators favourite French cyclist, Etienne Schroeder, bringing the event to a fitting close.